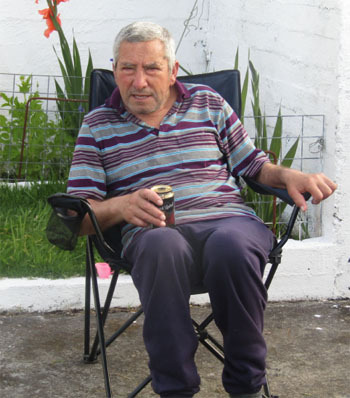 Obituary for Tristan da Cunha islander James Green, who passed away 9th February 2019, aged 75. James Patrick Green passed away on Saturday 9th February 2019. The funeral took place the next day. James was born on the 16th October 1943 to parents Frederick and Alice Green, and was one of eight siblings. He evacuated to the UK with the other islanders in 1961 when the volcano erupted. While in the UK he joined the Merchant Navy along with some other islanders and worked on the Castle boats. On returning home James married the late Letitia Green (née Lavarello) and had six children. He worked for the Tristan Government until 1966 then joined Tristan Investments fishing factory in 1967. At the factory James was responsible for all the glass fibre work that took place and became highly skilled in that line. He was also a skilled and successful fisherman, both skills he later passed down to his sons. During James years at the factory fishing boats were built on the island using a glass fibre mould, they were not imported. James loved visiting his plots at the patches and took good care of them. He was often seen before his illness carrying food to his cattle. Like most island men who have a love of the sea, he got great satisfaction from sailing in his longboat the British Trader to Nightingale Island and back. He also loved the outdoors and enjoyed mountain trips when he was much younger. James was a caring loving gentle person with deep sense of family responsibility. When he was not watching his favourite programme "Mrs Brown's Boys" He loved to sit and discuss fishing and the areas best to place fishing gear with his sons, sons-in–law and grandsons. James is survived by his loving sons, Grant and Desmond, and daughters Linda, Teresa, Lillie, Amanda and Samantha; sisters Martha and Francesca; brothers Benjamin, Kenneth and Terence, sons-in-law Cliff, Ricky, Jeremy and Adrian; daughters-in-laws Carlene and Donna, grandchildren Ivan, Steve, Justin, Leanne, Poppy, Kora, Calvin, Hannah and April; and great grandchildren Sophie, Ethan and Che. The family would like to thank all those who sent Sympathy messages.